Passing by the Kitchener Public Library along Queen Street, warm in a quiet snow-filled winter evening, footsteps silent into the white, is one of my favourite experiences. 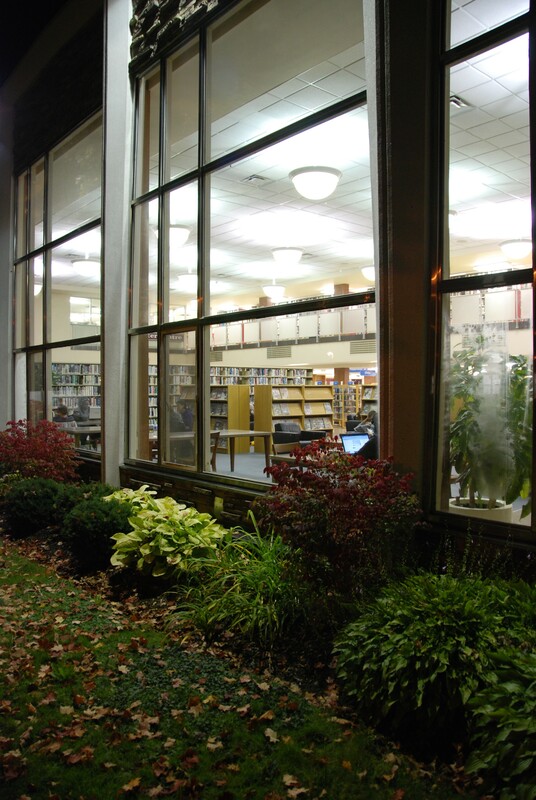 The library facade is a giant window on a world of knowledge, glowing in the soft darkness of the scene, a beckoning lantern of welcome. At the scale of the streetscape, the room plays the role of fireplace and centrepiece, inviting approach and radiating warmth. The generosity of its design always overwhelms me. I want to talk about one distinct example of how a piece of design, of architecture, can enrich our lives by paying attention to relations rather than things, and by including its context in its basic premise. 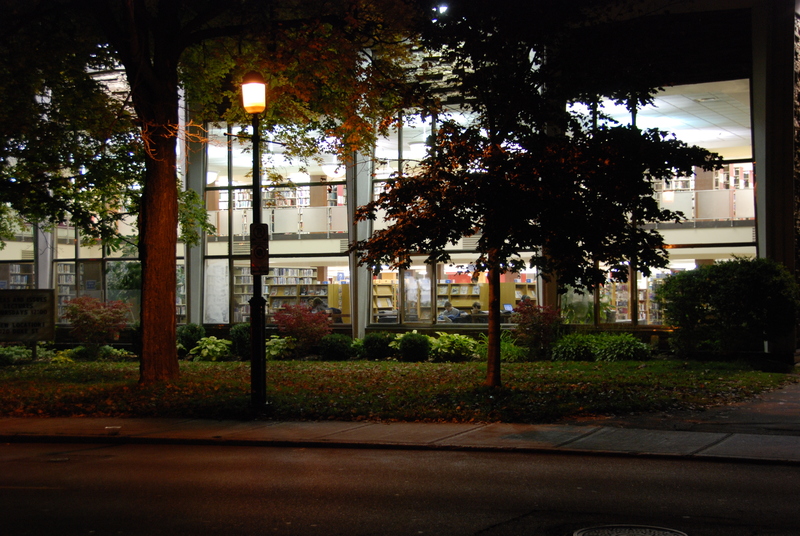 I’m going to talk about the front facade of the Kitchener Public Library, designed in the 1950’s and opened in 1962. Specifically, I want to concentrate on the deliberate and modern relationship among reading room, facade, and the streetscape of Queen Street. It’s difficult to see quite so well now, because the original facade lighting has been replaced with a kind of jail yard security lamp, but the idea can still be glimpsed. It still resonates, after almost 50 years. These days we rely a lot on signs and the written word to create meaning and relationships across the private property line and into the public way: “Outlet Mall”, or any pylon sign on our exurban streets, providing a list of what’s on the property, like a menu. For the designer, having to erect a sign, having to actually spell out “I’m a store, I’m a church,” is a sign of one thing only. A failure to craft relationships so that the design communicates an essential idea. The original library design is amazingly coherent. It’s a simple, yet wonderfully powerful public offering. 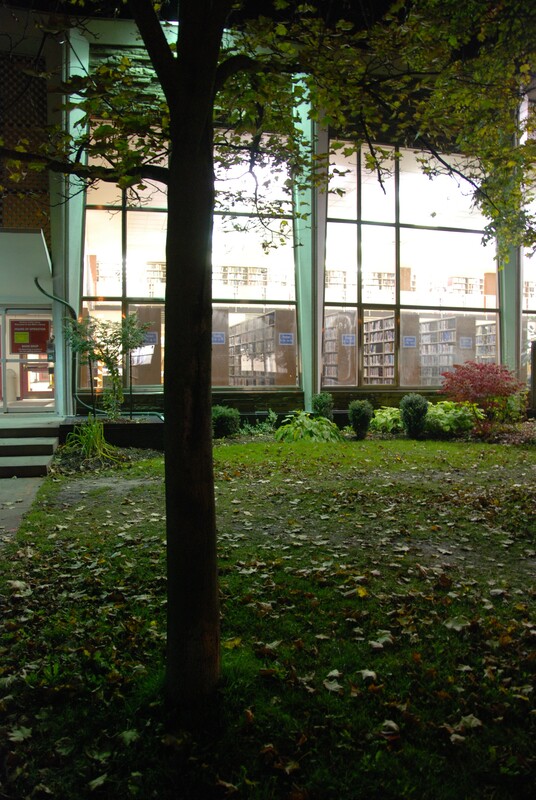 It’s very clear that the Public Library Board and its architect, 50 years ago, conceived the library as an enrichment of the public streetscape experience, rather than hoarding its richness for private consumption, and designing around an interior courtyard or back garden. So what did they do that’s so great? opened it right up to the street. Not in some courtyard, or back corner, not behind a line of parking. Right on the front facade. And then they took away that facade using a structural frame and the largest, most generous windows they could lay their hands on. The idea was most assuredly to offer this image of reading, especially at night, to the street and the world beyond. Careful design of the interior suspended lighting, the open arrangement to the book stacks and balcony within, and the exterior uplighting that some of us will remember but is sadly no more, were all arranged to reinforce the generosity of the big idea, the offering to the passerby. Any passerby. You, me, a child, a recent immigrant, for richer or poorer, the idea of the institution as a shining beacon of knowledge accessible to all is directly experienced, without even setting foot within. Without a sign. for the institution to fulfill. It’s a fabulous piece of work, and it will stand the test of time. This entry was posted in Architecture, Community, Design, Urbanism and tagged library on 2010/10/06 by adminjma.